When someone dies without leaving a valid Will, they are said to have died “Intestate;” in these circumstances, the Rules of Intestacy apply. 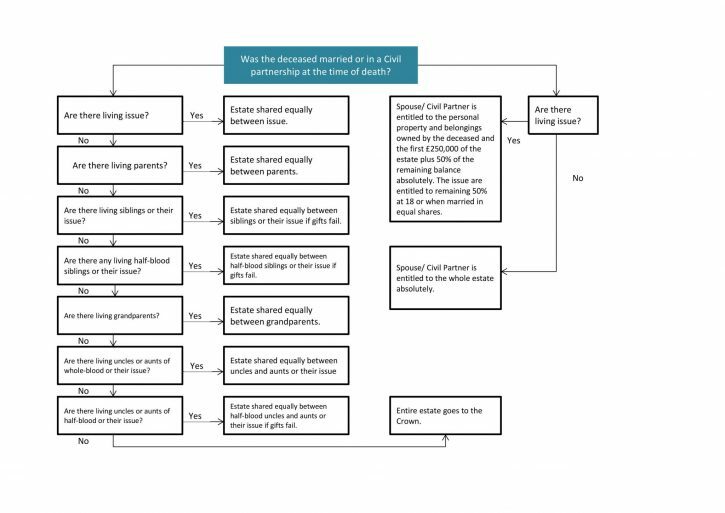 These rules determine who will administer and who will benefit from the deceased’s estate. The laws relating to Intestacy are strict, and assumptions that everything passes to loved ones when we are gone are, sadly, not always correct. The Rules of Intestacy are very specific regarding who can administer your estate, who will benefit from it and how much they will receive. It cannot be assumed that everything will automatically go to the surviving partner or immediate next of kin. A thorough understanding of the family tree will be required to apply the rules. If there are no living relatives, the estate will automatically go to the Crown. Unmarried couples or cohabitants – The Rules of Intestacy make no provisions for unmarried and unregistered partners. The surviving partner will not inherit any of the property and possessions owned in the sole name of the deceased. This often comes as a huge shock at an extremely difficult time. Step children -The Rules of Intestacy do not recognise step children; only biological and adopted children can inherit from the estate. Step parents and step brothers or sisters – The Rules of Intestacy do not acknowledge step parents and step brothers or sisters. Without a Will they will not benefit. Friends – Many people wish to leave property or possessions to friends who are not members of the family. Without a Will, friends will not benefit as they are not acknowledged by the Rules of Intestacy. Charities and organisations – You may wish to leave gifts to charities and organisations. However, without a Will, these gifts will not be made because the Rules of Intestacy only recognise family members. The only way to guarantee that your property and possessions go to the people you want is to write a Will. If a family member has passed away without a will, Accord Legal Services Ltd can help with the Administration of the estate. The rules are complex and every family’s circumstances are different; contact us for specific advice tailored to you. We will take on all the responsibility and potential liability associated with administering the estate of the deceased. You will be provided with a personal, confidential and expert service, giving you peace of mind that everything will be handled correctly and efficiently.